Looking for souvenirs for your family and friends? Or something for yourself?. Chubu (central) region of Japan including Nagoya has been a place for both traditional and modern industries. At the same time, this region has the highest mountain and mountain ranges as well as the deepest seas in the country. There are beautiful forests and rivers, lakes, bays and islands. Primary industries such as agriculture, forestry and fisheries are also abundant. These combined, Chubu region is the best place to experience something new to you from the nature to modern industries. We are offering guided experience tours from Nagoya. If you are interested in experiencing something, please contact us, even it is not in the lists of activities below. We are going to find if for you. Do you like to wear Kimono, Yukata, Samurai or Ninja costumes? Various places are offering you to transform yourself. Iga, home of the Iga-ryu Ninja, is full of sightseeing spots related to the Ninja! In addition, the town attracts visitors with its antique wooden-style architecture. 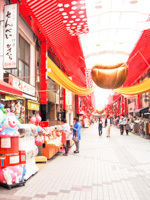 The city also boasts for having traditional crafts such as the Iga-yaki (pottery) and Kumihimo, and of course the local specialty represented by the Iga beef. 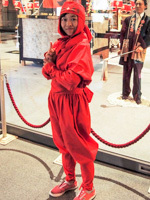 Why not dress up as a Ninja and walk around the area to make good memories of Japan? Little World is an open air museum that exhibits cultures in the world. What is real fun in the Little World is world foods and costumes. There are so many restaurants and coffee shops offering different kinds of foods, drinks and sweets from around the world. There are also about 10 costume stands where you can rent costumes from around the world. The Castle of sweets look like a real castle in Europe. This is a facility build by a Japanese sweet maker. 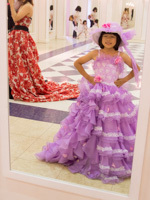 Recently it has became a popular place, especially among young ladies, where you can be a princess and take your own photo. Nagoya is surrounded by major production areas of pottery such as Seto, Tajimi, Tokoname, Yokkaichi (Banko) and Shigaraki. 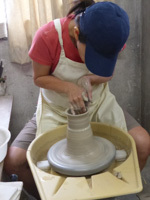 Many pottery studios offer the experiences to make pottery with potter's wheel. Seto is the country's leading production area of ceramic and porcelain with a long history, that in Japan people generally call pottery as "Seto-mono". Even today, there are many studios which keep on creating various art pieces. Have a relaxing moment in this historical town and experience pottery making to feel the alluring art of Japanese ceramic works. Nagoya is surrounded by mountains. 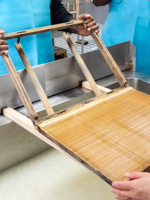 Especially in Gifu and Nagano Prefectures, there are many workshops producing wood products. You can also enjoy making something from wood. 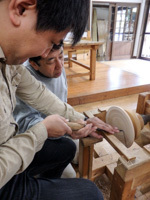 If you are interested in traditional craft work, visit the "Kijishi-no-sato" which is in a 10 kilometer-distance from Tsumago-juku, where wood turning craftsmen gather. 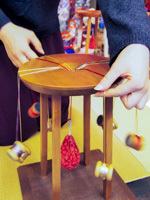 The "Nagiso Rokuro-zaiku", a traditional craft work in this region uses spinning wheel to grind wood and make products. Its technique has been passed down over a thousand years. Each product is beautiful, yet practical. Do not miss the chance to see the fascinating skills and technique of the local professionals, which are reflected onto the artwork. Ogaki is the Japan's biggest production area of the Masu cups. 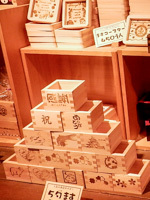 Souvenirs and "make your own Masu cup" course available at "Masuya". Why not make your original piece? Yamagami Shoten offers a tie-dyeing workshop. (Advance reservation required.) 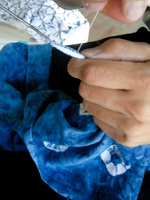 Experience dyeing a handkerchief, Tenugui towel, or a stole. (Fee from 1,000 yen depending on the material used.) Workshop duration is around 2 hours. Let us look into one of the typical Arimatsu tie-dyeing techniques, the "Kumo-shibori". The final output varies according to the person who makes it and how the cloth is being tied. You can choose your own color and style. Make your original piece, the only one in the world. Washi or Japanese traditional paper was designated as one of Intangible cultural heritage by UNESCO. Mino Washi is one of the three famous production areas registered. There is a record of Mino Washi used in the then capital of Japan, Nara, in 8th century. Mino-Washi Museum in Mino City conveys the fascination of Mino Washi paper through exhibits and workshops. There are at least three regulary held paper making courses: Minohan course, Rakusui course, and postcard course. A Shoka (calligraphy master) instructs you how to write kanji characters with fude (Jamapese pen) and sumi (ink). You can create your own calligraphic art with your favorite kanji letters and make it a hanging scroll. The practice takes only a few hours so you can combine this practice with other tours.